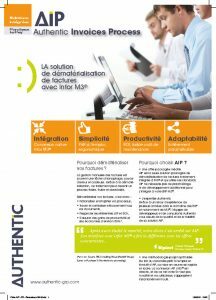 AUTHENTIC has developed AIP for complete integration of your automated invoices into INFOR M3. AIP is the only packaged supplier invoice automation solution that is fully integrated into INFOR M3® and uses its standards. AIP requires no additional configuration or development before being integrated into your M3 ERP. AIP’s out-of-the-box, upgradeable features make it quick and easy to implement. Connection between API and M3® is direct, meaning that your IS remains unchanged and your users can get to grips with the tool immediately. • Error reporting by supplier, invoice type, period, etc.